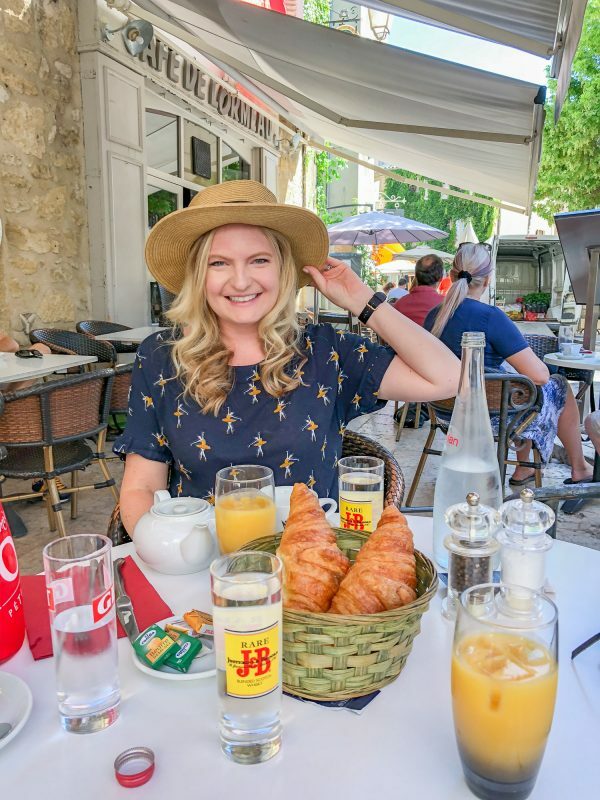 After taking more red eye flights to Europe than I care to count, I am sharing my red eye flight guide. I am teaching my secrets to arriving feeling refreshed and ready to go. There is nothing more exciting than waking up in a new place to explore. 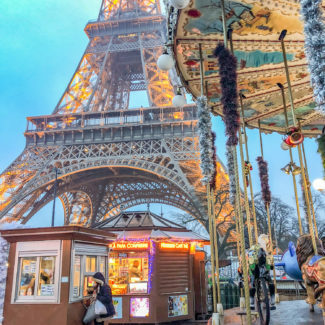 Remember when Carrie Bradshaw said, “I want to arrive stunning and impossibly fresh looking”, before flying to Paris. That’s everyone’s goal when they take a red eye flight to Europe, right? Today I am sharing my secrets to looking and feeling my best after a red eye flight. 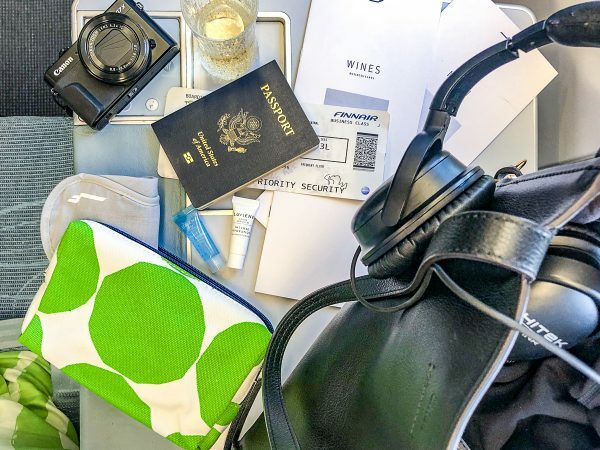 The biggest benefit of taking a red eye flight is that you won’t waste your day traveling. Vacation days are precious and by taking a red eye you won’t waste a day of your vacation sitting on a plane. Plus, I think taking a red eye gives you a better chance at fighting off jet lag. By flying at night you can take advantage of the hours of sleep that overlap between time zones. This makes it easier to get on the new time zone. Think of it this way, if you are on the east coast, London is 5 hours ahead. This means that there will be a few hours when your normal bedtime will overlap with London’s timezone, taking a red eye flight lets you take advantage of that time by sleeping while you are in route to your destination. I like to take a Red Eye that leaves at about 8pm and arrives in Europe at around 10am. Some red eye flights get into Europe so early that nothing is open yet – you don’t need to arrive at 6am. 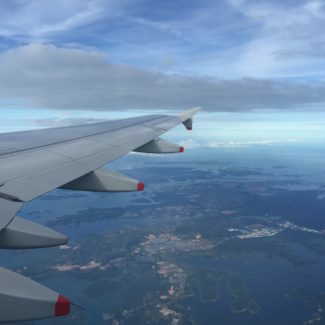 By arriving a little later you will be able to sleep more on the flight – especially since those last few hours of the flight are when I get the most sleep. Your goal should be to sleep on the flight. 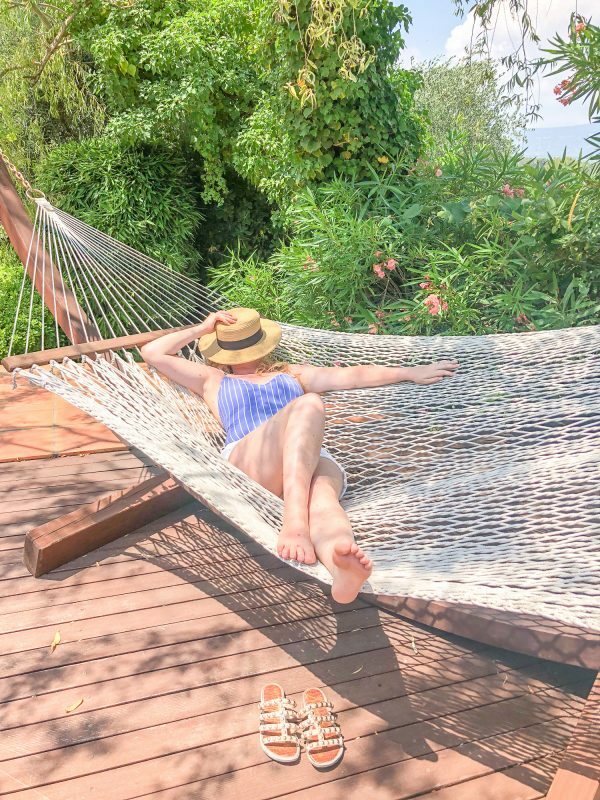 You want to sleep enough so that you can make it to your destination and start exploring without needing to take a midday nap. Once you land, your goal should be to be able to look refreshed and ready for a day of exploring. 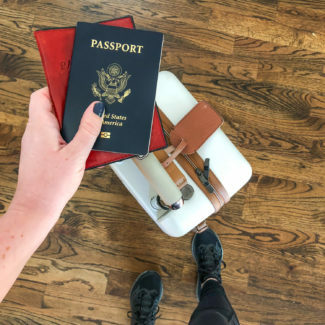 Keep in mind that if you take a red eye, you will likely be arriving hours before you can check into a hotel, so plan to use the restroom at the airport or your hotel to freshen up. This is so easy, which is why it is so smart. Wake up early the day of your flight. 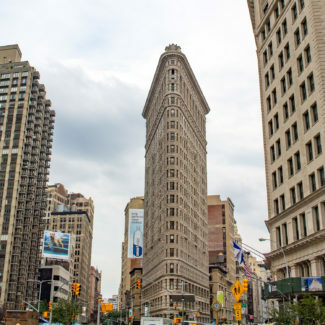 Start the process of getting adjusted to another time zone. Get up two hours early, and hopefully you can start sleeping two hours earlier that night during your flight. For example, I usually get up at 8am, but I will get up at 6am if I am flying to Europe that night. I want to be tired by the time I get on the plane, and ready to sleep as much as possible during the flight so that I arrive in Europe ready to take on the day. These are the items that I make sure to pack in my carry on. 1. 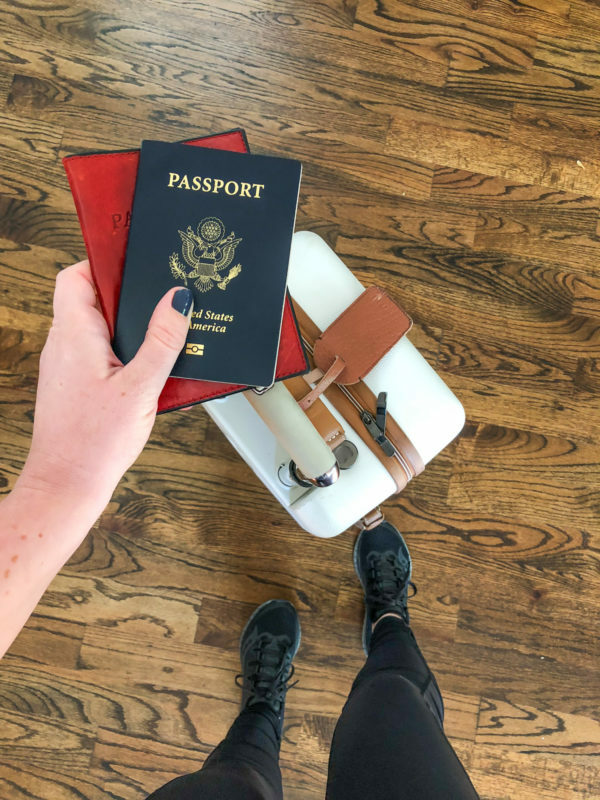 Pen and Passport: You need the pen to fill out the customs phone, and of course you need your passport to go through customs. I love this matching luggage tag and passport case for storing your passport. 2. A Leather Cord Storage: This chic monogrammable roll up will make sure your headphones and charges won’t turn into a tangled mess in your bag. 3. A Soft Cardigan for the Flight: A cozy cardigan will keep you warm, while looking stylish, during the flight. 4. A Cashmere Blanket Scarf: Flights can be very cold, and you can use this as a scarf or a blanket. 5. 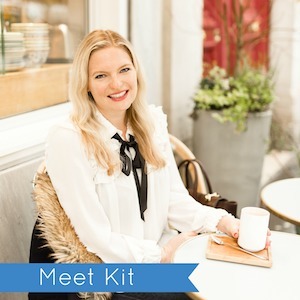 An Eye Mask: I resisted using an eye mask for years, but it really does help me to get as much sleep as possible – especially when I want to sleep through breakfast service when the turn the lights on. 6. A Neck Pillow: If have found that using a neck pillow really increases the number of hours that I am able to sleep on a plane. 7. A Durable Charging Cord: This type really does last longer and doesn’t tangle as much. 8. The Adapter Lets Your Charge and Listen: This $6 adapter solves the iPhones most infuriating problem and makes it possible for you to listen to music while you charge your phone. 9. Lumene Hydrating Eye Gel: This eye gel that I discovered in Finland is light and easily absorbed into the skin. It’s a game changer, and I use it whenever I fly. The best thing, the travel sized tube is under $10! 10. Makeup Removing Wipes: Just after takeoff and right before I start trying to sleep, I take off my makeup with a makeup removing wipe. I love the scent of the Burt’s Bees Grapefruit Wipes the most. 11. Lumene Moisturizer: Once the makeup comes off, the moisturizer goes on – I use it along with the eye gel. The air on planes is dry, and it will dry out your skin, so I like to counteract this by moisturizing. I linked to the $20 Lumene travel set – I use their moisturizers too. 12. Dagne Dover 365 Large Landon Neoprene Carryall Duffel Bag: A big durable duffle that will still slide under the seat in front of you. It won’t break the bank either. 13. Henri Bendel Jetsetter Bag: A backpack that converts into a satchel, and its stood the test of time. I’ve had mine for year and it looks great after climbing through canyons, horseback riding, and glacier climbing. 14. My Go-To Tote Bag: This bag is just the right size, and it even fits my camera and laptop. It’s a nice addition to my carry on roller bag, that can be my default bag during any trip. Water: Flying dehydrates you, so water is important. I drink extra water before the flight, and I drink a lot of water once the plane lands. 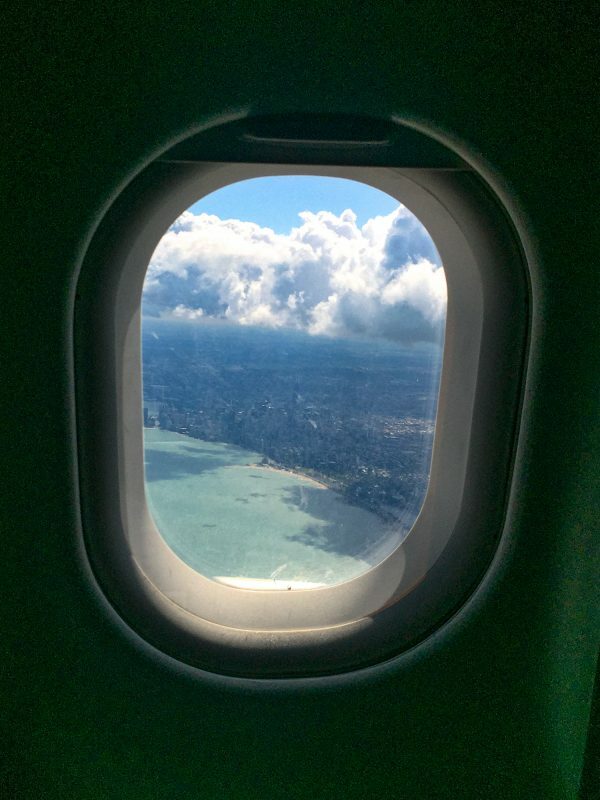 I don’t go overboard with the water during the flight because I don’t want to get up to use the restroom – especially since I like to sit in a window seat. Snacks: I stash snacks like granola bars in my purse because I don’t want to rely on the not-so-great in-flight meals. A OTC Sleep Aid: I like to take a sleep aid to help me get the most sleep possible on the flight. I often fly from Chicago to London, and that flight time is 7 hours and 45 minutes. In order to focus on getting as much sleep as possible, I eat at the airport before the flight. I walk onto the plane ready to sleep. I want to spend as much of that 7 hours and 45 minutes sleeping as possible. If you eat dinner on the plane, it will eat up a least an hour of time that you could be sleeping. Breakfast is usually served about an hour and a half before landing. I don’t really need yogurt and a mediocre croissant, so I skip this and keep sleeping. 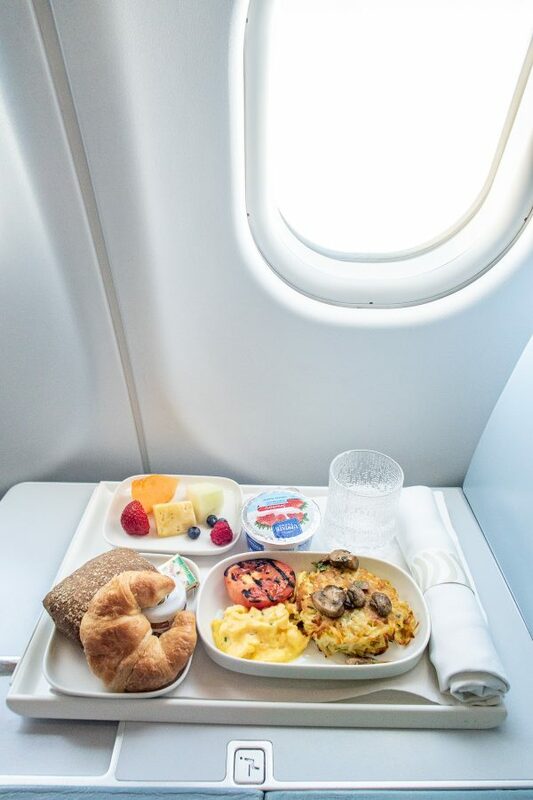 Overall, if you eat dinner and breakfast on the flight, you could be robbing yourself of over 2 hours of sleep. I always recommend sitting in a window sleep because I get the best sleep when I am leaning against the window. The other benefit to sitting beside the window is that no one will need to wake you up if they need to use the bathroom. Toothbrush and Toothpaste: The first thing I do when I arrive at the airport is brush my teeth. It makes me feel clean and refreshed. Dry Shampoo: This brings my hair back to life after a flight. It absorbs grease and adds volume. I have linked to my favorite brand for you. Change of Clothing: Always always always bring a full change of clothing with you in your carry on. This way you are all set if your bag took an unexpected detour, and you can quickly and easily change and get ready for the day even if you can’t check into your hotel room yet. Makeup: I usually put fresh makeup on just before the plane lands. You and find my makeup packing list here. Airborne: I like to give my immune system an extra boost after a flight. 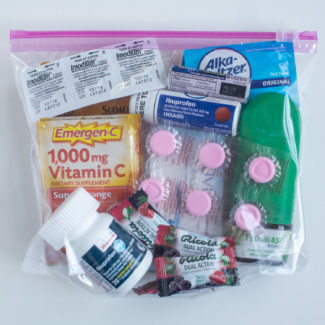 You can read about the over-the-counter medicines that I pack when I travel abroad here. Sleeping: Do not nap. This will make things harder on you in the long run. Get out and walk around, get a coffee if you need to, but I find that if I stay on my feet I don’t get too sleepy. Eating: You want to eat during meal times to get your body adjusted to the new time zone. And most importantly, stay awake until 9pm. Do not be tempted into going to bed at 7pm. If you go to sleep too early, chances are you will wake up in the middle of the night and not be able to go back to sleep. Set yourself up for success by going to sleep at a time that let’s you sleep 8-9 hours without you waking up too early. I like to take a half dose of a sleep aid just to make sure that I don’t wake up in the middle of the night. 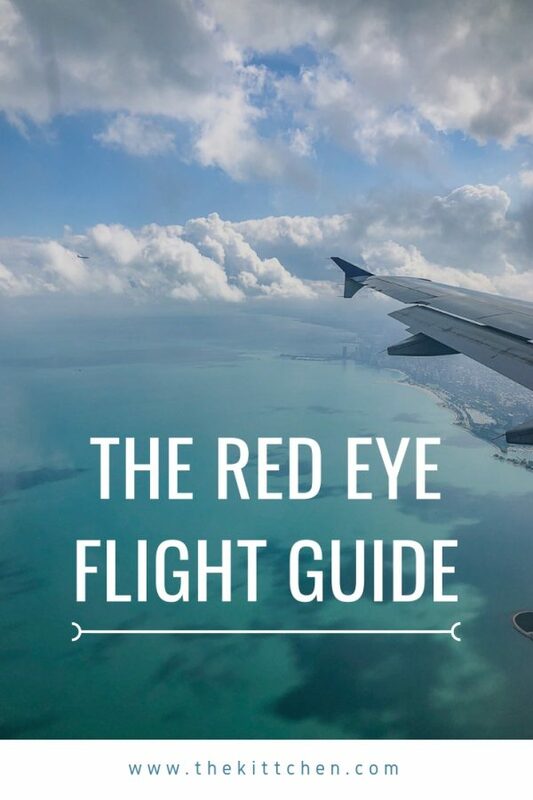 Do you have any tips for my red eye guide? Share them in the comments!